MOVIESCHAIN PLATFORM: blockchain based decentralized film distribution. MoviesChain by TVzavr is the world’s first blockchain-based, secure platform that directly brings together film viewers and independent cinema. MoviesChain from the streaming platform TVzavr gives independent film producers the opportunity to rent or sell their projects to a global audience and enjoy 90% profit. MoviesChain by T Vzavr works by having ZVR tokens transfer value from an independent film rights owner directly to a customer over the MoviesChain by the T Vzavr network. MoviesChain by T Vzavr is the first film distribution platform that is based on blockchain technology that brings radical changes to the existing technological and marketing systems for film distribution. MoviesChain by T Vzavr is a decentalized platform that disintermediates the independent film distribution industry delivering unmatched efficiency, transparency and global scalability. The ultimate goal of the Movies chain platform by TVavr is the creation and prosperous growth of a fully decentralized, independent film industry. 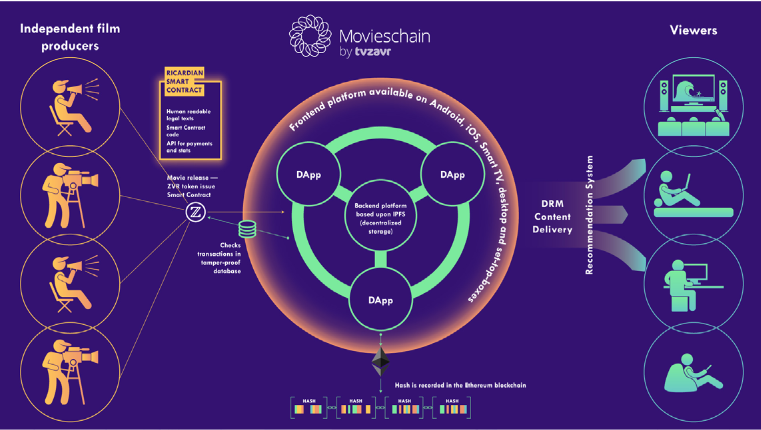 MoviesChain by T Vzavr, with its use of blockchain technology, will focus on eliminating the intermediary distributors between viewers and independent producers of quality films. The mission of MoviesChain by T Vzavr is to provide customers with affordable, quality independent films and independent filmmakers with a transparent system to distribute content on very attractive financial conditions. Token ZVR ZVR Coin is a unique Blockchain cryptocurrency that provides exclusive access to films by independent film producers. The ZVR token allows you to rent or buy video content on the MoviesChain platform, allowing anyone to access high-quality content. MoviesChain's transparent bookkeeping methods and attractive pricing will restore the trust and confidence of the original creators, thereby ensuring artistic freedom of expression and improving customers experience. The ZVR will be launched on the Ethereum blockchain as ERC tokens and after a certain number of tokens have been sold, the cost of tokens will gradually increase over time. The ZVR Token sale will take place from 2018 Q2 to 2018 Q3. The exact date of token sale to be announced. The softcap will be $5 million, and the hardcap will be $30 million. The Acceptable cryptocurrencies that can be used during the process of Token sale are: ETH and BTC. The price for tokens will be determined when the Token sale launches. All unsold tokens will be burned. In the case that the revenue from the Token sale is less than $5 million, then all collected funds will be returned to the original owners. All allocations will be changed proportionally, keeping the same percentage of allocation for initial sale, reserve fund, bounty campaign and allocation to the team, if less than 70 million tokens are sold during the initial sale.